So, what does Tmux do? 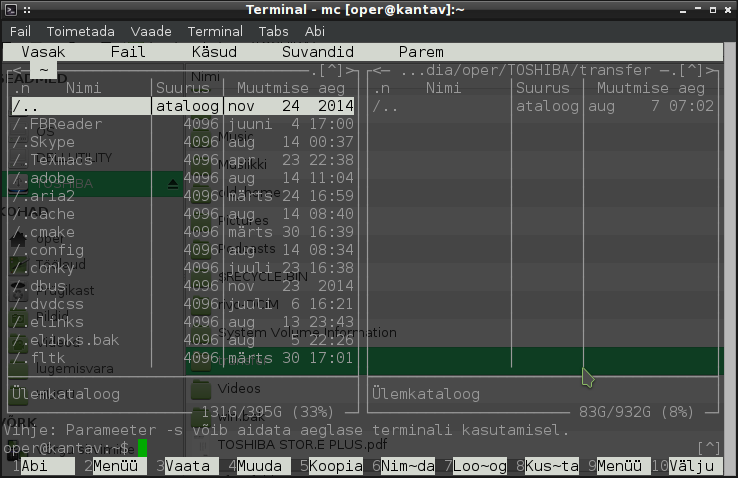 After installation, open up a terminal emulator and type tmux. You will have a new emulator screen with a cute status bar. Open an app there or leave a process running. Next, type Ctrl+b. This is the prefix for all the commands given to Tmux rather than to the app or process (called “client”) you are running inside of it. The prefix done, press c (i.e. prefix+c). A next screen opens up. The status bar will show you how many screens (called “windows”) are opened and you can determine in which one your current focus is. To switch between windows, press prefix+n (for next window) or prefix+p (for previous window). By default, these keys should cycle through all, i.e. prefix+n should take you to the first window, when you are currently in the last window. Prefix+” will split the current window into two tiles (called “panes”) horizontally. Prefix+% will split it further vertically. Prefix+o will move focus to another pane in the current window. Prefix+space will switch to a different layout. There are several layouts, so try prefix+space multiple times to see them all. Prefix+z will zoom the focused pane over the entire window. Prefix+o (i.e. move focus on another pane in the same window) shrinks the zoomed pane. Resizing the panes should be possible by dragging the border of the pane with mouse. The rest of the keyboard shortcuts are under prefix+?. There are enough basic intros to Tmux on the internet already, so I’ll better focus on the awesome copy-paste function, which is otherwise rather difficult to achieve in terminals. There are two modes for copy-paste, Vim and Emacs. The more likely default is Emacs and I like it better, so here’s a list of its basic routines. Prefix+[ or Prefix+PageUp enters the copy mode. An indicator lights up in the upper right corner. Use the arrow keys (without prefix) to get to the point you want and Ctrl+space (without prefix) to begin selecting. Use arrow keys again to draw out the selection and Alt+w (without prefix) to copy the selection. Upon copying, the copy mode indicator vanishes from the upper right corner, i.e. the copy mode terminates at Alt+w. If you want to exit the copy mode any time when it’s active, press Escape or Ctrl+c. To paste, move with arrow keys (and switch the panes and windows if necessary) to the spot where you want to paste the copied content (called “buffer”). On the spot, press prefix+] to paste or prefix+= to see the buffer and then Enter to paste. Copying and pasting in Tmux is rather important, so let’s try again. There are some nice pages in Tmux, such as the internal help page, which are in copy mode even without entering the copy mode, and this is good for exercise. A note: Tmux copy-paste buffer is available only inside Tmux, not in other apps and not on the clipboard. Open up the list of keybinds; prefix+? Attaching and detaching sessions is an advanced feature, but worth some practising too. First let’s go over some terminology again. Clients (apps or processes) run inside panes and there can be multiple panes in a window (a single screen view of the terminal emulator or console). All these windows make up a session. The new session starts as soon as Tmux is started. Prefix+s provides a list of running sessions and an opportunity to switch between them. Selecting a session this way is called attach. Prefix+d detaches the session. This means that even when you close the terminal emulator where you had Tmux running, all the processes in the session remain active as long as the user session in the computer remains active (i.e. don’t log out, don’t shut down the computer). 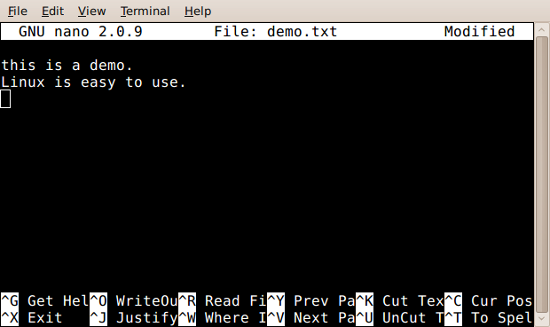 To test the attach/detach feature, press prefix+d to detach from the running session in the terminal emulator. Close the terminal emulator and open up the console (tty, normally Ctrl+Alt+F2 through F6 in Linux). In console, log in as the same user and type tmux. In Tmux, press prefix+s. You should see at least two sessions running. That’s the idea of attaching and detaching. There should be a configuration file located at /etc/tmux.conf, but if not, create an empty file at ~/.tmux.conf. As long as it’s empty, Tmux uses its defaults. If there’s something in ~/.tmux.conf, Tmux uses that. My ~/.tmux.conf looks as follows. set -g default-terminal "screen-256color"  ##useful info on the status bar (if I use it): temperature, load, battery, and clock  set -g status off set -g status-position top set -g status-right "[#[fg=red,bright] #(cat /sys/class/hwmon/hwmon0/temp1_input | colrm 3) °C#[default] ][#[fg=cyan,bright] #(cat /proc/loadavg | colrm 5) #[default]]#[fg=green]#[bg=black] #(cat /sys/class/power_supply/BAT0/capacity)% #(cat /sys/class/power_supply/BAT0/status) #[default]#[fg=yellow,bright] %a %R #[default]" set -g display-time 3000 set -g mouse-resize-pane on set -g visual-bell on set -g bell-action none set -g visual-activity on set -g lock-after-time 3000  ##useful titles: window number, process name, and its tmux status set -g set-titles on set -g set-titles-string "tmux.#I.#W.#F" setw -g aggressive-resize on  ##unbind the default keys so they can be reassigned  unbind-key - unbind-key s unbind-key p unbind-key f unbind-key q  ##to see the status bar when needed bind-key b set-option status  ##get the focused pane out of the way into a new background window bind-key - break-pane -d  ##expand the sessions list to select a window interactively bind-key s choose-tree -suw  ##a useful list of all panes to see something to fetch ##the last item with % included is most useful for fetching bind-key p list-panes -asF '#I.#P.#W.#D'  ##fetch a background pane into the current window bind-key j command-prompt "join-pane -ds '%%'"  ##reload the configuration file bind-key f source-file ~/.tmux.conf \; display-message "configged!" ##monitor activity in the focused window bind-key a set-window-option monitor-activity \; display-message "monitoring this window"  ##kill all sessions except the named one bind-key q command-prompt "kill-session -at '%%'"
If Tmux seems hard, try Byobu that is gleefully configured out of the box and pretty much explains itself as you use it. The keybinds are totally different from Tmux though, no relation at all. Top or ‘top’ is a process viewer-and-manager for Linux. Another one is Htop or ‘htop’ that comes with more one-key shortcuts and a saner default display (colours that are more likely to be visible). However, Htop’s single-hit keybinds for e.g. killing the currently selected process easily make the user vulnerable to fatal accidents. Also, Htop is not pre-installed too often, so it’s a good idea to know some Top. At this point, I normally want to change the colours. Shift+z takes to the page where to select colour schemes, a cycles between the schemes, q returns to the processes page. 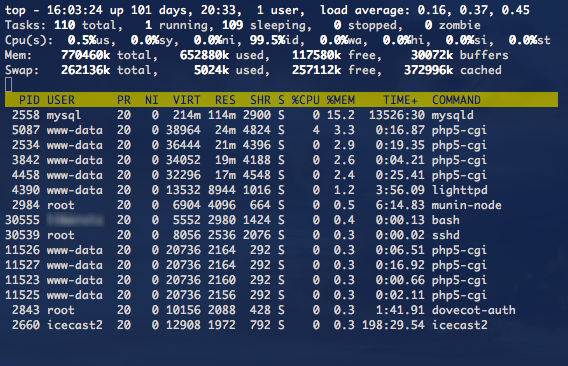 The processes are ordered whichever way, but Shift+p orders them by CPU usage. If the refresh interval is too fast, d lets you change it. Want to kill a process? Shift+l lets you filter up a process and k begins the step-by-step procedure of killing it. Shift+w saves the state, so that next time you open Top, it shows the same colours and lists the processes by CPU. A helpful list with more shortcuts and keybinds is found under h.
Thunar is my preferred file manager, but a lack of dual panes (F3 in e.g. PcmanFM and Nemo) for easy drag-and-drop is sorely missing. There’s an installable patch somewhere on the internet, but patches are too geeky to install. Here’s how to survive without patches, while not missing out on the functionality of dual panes in Thunar. That’s right! Two windows provide the same functionality as dual panes, so get accustomed to opening up two windows of Thunar, arrange them neatly, and then drag-and-drop etc. as you wish. 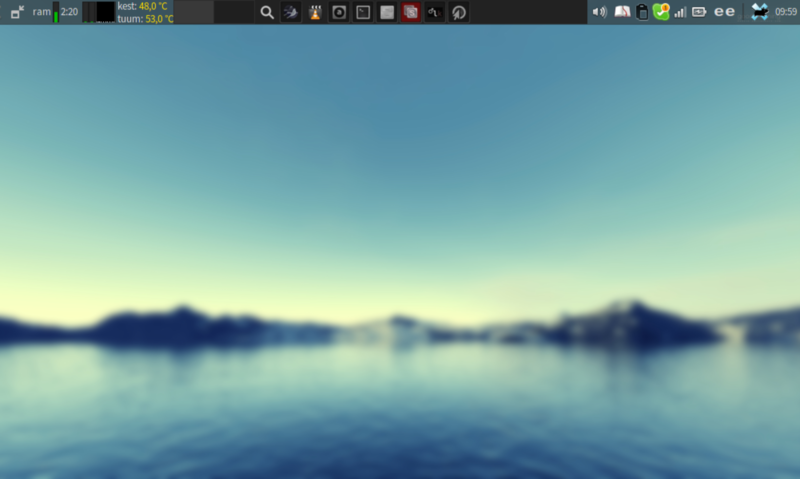 Xfce, the default desktop environment which includes Thunar, has some auto-tiling functionality these days, which comes in conveniently handy for arranging windows. Depending on the way you arrange the windows, you may want to get rid of the sidebar in one of the windows. The keyboard shortcuts Ctrl+b and F9 do that in Thunar. Method number 2 requires two things: 1. Midnight Commander and 2. Creating a custom action in Thunar. If you like Midnight Commander, a command-line file manager with dual panes, and you have it installed, this method is for you. This way, in addition to dual panes, you will get also the flexibility and speed of command line. In addition to this code, remember to unset everything in Appearance Conditions and leave only Folders – the same appearance conditions as for Terminal custom action. This will launch Midnight Commander with -b option so as to get rid of its default colors. If you have a transparent terminal emulator, the additional advantage with this option is that you will get background visibility to Thunar. This is properly triple panes, even better than dual panes. In an earlier post I introduced tiling desktops a.k.a tiling window managers whose notable feature is to make maximum use of screen estate. This post is about how to make Openbox always open maximised windows. Just in case, make a backup of Openbox main configuration file .config/openbox/rc.xml. This is the file that needs some editing. Open up the rc.xml and find the section <applications>. This must be a major section, not a command concerning a specific application. The first codebit tells Openbox to maximise all windows and lose their decorations. If you want to keep the decorations, don’t use the <decor> tags. The second codebit (beginning with the line containing “dialog”) tells Openbox to exempt dialogs from maximisation. This works for applications that have their dialogs and prompts properly codified as such. Not all of them are properly done. Note the class property in application tag. Mostly the ordinary application name fits into that property. Another possibility is to use the name property, which should be the text on the titlebar. All necessary changes done, save rc.xml, run openbox --reconfigure and see the effect of the changes to your windowing. In more established terminology, stacking window managers are distinguished from tiling window managers, but I prefer to think of them as windowing desktops versus tiling desktops. The first type is vastly more widespread. Windowing is the main idea behind all Windows releases (it got slightly fuzzier with the unpopular release 8, but was restored in 8.1 and stays so in version 10). Tiling involves specialised and geeky desktops, but is not really more complicated than windowing, particularly if the user is keyboard-centric, as distinguished from mouse-driven. The main characteristic that sticks out in windowing desktops (‘stacking window managers’ in more established terminology) is that application windows can be maximised, minimised (‘iconified’ in Linux terminology), and stacked partially above each other. Thus there are layers of placement on the desktop (‘top’ and ‘lowered’) and a mouse-click or cycling keybind (Alt+Tab) will raise a lowered window above others, i.e. to the top layer. In contrast, a tiling desktop presents application frames (‘windows’) in neatly ordered tiles in a single layer. There’s no lowering or raising, there’s just shifting focus from a tile to another by keybind or mouse. Normally there are no breaks in between the frames, so the space is put to maximum use automatically. Due to a single layer and tight positioning, any resizing and repositioning of a tile affects all other tiles. It is usually inconvenient with a mouse and cannot be done without consideration to the whole layout of the workspace. Some notes on the tiling desktop in the image. You may want to fullscreen the video, but this would naturally leave the rest of the tiles behind – which is similar to any windowing desktop. Alternatively, you may want to maximise the text editor window and resize the video smaller in a corner, for example when transcribing from the video, to give maximum space for writing and minimal necessary space to the video. In normal tiling mode, the video tile would always take up a column or row equal to its width or height, but on some tiling desktops there’s a specific ‘floating’ mode that can be assigned to a specific tile. However, the floating tile would always be on top of the rest of the layout – there’s no concept of layers, i.e. raising or lowering. There’s also no concept of minimising or iconifying in a tiling desktop. You cannot add icons to the desktop to click and you cannot minimise all frames to view the desktop. To view the desktop (the background image or conky or what you may have there), you will need to open up a new fresh desktop space. On the other hand, creating a maximally useful layout with two apps side by side is extremely easy in a tiling desktop. 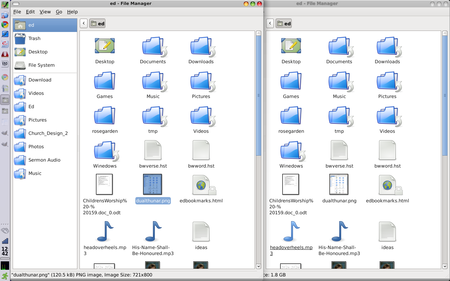 The classic dual-pane view of two apps side by side (as in comparing documents) is what normally happens in a tiling desktop all by itself when you open up the first app (it comes up maximised) and then the second (the first one resizes to take up half of the workspace and the second one takes up the other half). Very convenient. When you want more apps open than the workspace can fit, there are easy default keybinds to send the focused tile to another workspace. If you cannot do without the experience of raising and lowering, you absolutely need multiple workspaces in a tiling desktop. Some tiling desktops may feature a ‘scratchpad’ which essentially does the same thing – the equivalent of lowering a window, hiding it from sight without opening another workspace, keeping it open in the background, ready to be recalled by a keybind. Even given a scratchpad, multiple workspaces are an inevitability in tiling desktops. An additional compensating feature in tiling desktops is the ‘stacking’ or ‘tabbed’ mode. In this mode, the workspace does not create new gradually shrinking tiles when new apps are opened. Instead, every new app opens up maximised. Thus you always face a single maximised frame at a time, and to get to any other app, you switch to another maximised frame. This makes actually pretty good sense on small screens, such as netbooks. From the user’s point of view, the choice between tiling and windowing first boils down to whether the user prefers mousing or keyboarding. Mousing is much more limited on a tiling desktop. Keyboarding is essential. Moreover, not all windowing features are easy to re-create on a tiling desktop. For example, I personally began immediately to miss proper cycling, by which I mean switching between all apps without regard to their position on the screen or location on workspaces (Alt+Tab). The tiling desktops I tested preferred to recognise directional cycling, i.e. you have to know whether the app you want is to the left or right or up or down, and the number of workspace where it’s located. So, it’s important to remember where you open up things, perhaps by making workspaces topical, like “Internet” or “Office” or “Games”. In summary, there are some very interesting features in tiling desktops which may make you switch from a windowing desktop for greater productivity. Or, if not switch, you may discover features that you may want to re-create in your familiar windowing desktop, for example always maximise windows in Openbox. And there’s a link available to a tiling window manager demonstration. To enable arrow keys to search history for the ending of a half-typed line. Usage: Type something in terminal that you know is the beginning of a long command line that you occasionally need. Arrow keys up and down should complete it. Alert in OSD when a process ends. Usage: cmd; alert where ‘cmd’ is an arbitrary command that performs a process, e.g. wget. An archive extractor without installing another program. Colors for man pages, Gentoo style. Usage: Open a man page and notice the difference. On GNU/Linux, a highly useful command for beginners is man. It means “manual” and it’s the documentation and tutorial that comes with the installed operating system. Man pages are accessed by typing man cmd where ‘cmd’ is a command that the user wants to know more about. For example try man cp. Linux man(ual) pages are not big news actually. What may be more of a news is that the page viewer that is opened by man is actually a text file viewer that is called ‘less’. So, ‘man’ opens up ‘less’ a certain way. Move around with arrow keys, PgUp, PgDown, Space, Home and End. By default, it wraps long lines rather than truncates them, just like all viewers and browsers should do, in my opinion. Search with /. Find next with n and find previous with Shift+n. Shift+f goes to the end of file and keeps reading it. This is highly useful when piping a file that is being written, to always see its end. For example sudo tcpdump > file | less file and in ‘less’ Shift+f. Enable line numbers in the file with the -N option, i.e. less -N file. Open the editor with v.
An overview of the keybinds under h.
Not all these features work when you have ‘man’ open rather than ‘less’, but for example v for editor (which indeed doesn’t work in ‘man’) is a great feature. Normally, one would not want to change the file by mistake, so it makes sense to open it in a viewer like ‘less’, but when the need for editing arises, ‘less’ conveniently redirects there when you press v.
The standard editor in Linux is ‘vi’, which happens to be my least favourite editor. The only thing I want to know about it is how to get out of it. For beginners, ‘nano’ is much more convenient, because it has a helpful commands list at the bottom by default. This should be all for most purposes. Usually ‘nano’ comes preinstalled, so nothing to worry about. Ctrl+w to search. Alt+w to repeat last search. Alt+r to find-and-replace. Ctrl+k to cut the entire line and store it for pasting. Ctrl+u to paste what’s stored. Uninterrupted consecutive cuts are all stored-as-one, e.g. three times Ctrl+k cuts three lines below each other and then Ctrl+u restores them all. This enables moving consecutive paragraphs around in the file conveniently. Note however that when the cursor is moved between cuts, the sequence of cuts starts over. Ctrl+r to open the system file list, enabling to pick a text file to add into the currently open buffer. Ctrl+o to save the file either with the current or a different filename. In this state, Ctrl+t opens the system file list to pick a file to replace (save as). * See man bash and search for “readline notation”. Nano uses the .nanorc file for further configuration. An example of it is located at /etc/nanorc or thereabouts. My ~/.nanorc looks as follows. Rawdog is a console-based RSS feed reader. After installation it doesn’t show up anywhere. It works by typing rawdog in terminal, but there’s some configuration to be done before it does anything useful. The URL here is the feed for my Vivaldi blog. The backslashes are escapes needed for console. Rawdog will report if adding the feed was successful. You can add many feeds of course. The added feeds will appear at the very bottom of the config file located at .rawdog/config. The -W argument is supposed to check the state and state.lock files in the profile directory, i.e. to check the status of previous updates. The -u argument updates the feeds. The -w argument writes the output. The -v argument makes it verbose, so you don’t get bored while waiting the program to finish. Rawdog’s output is output.html, a static HTML file. To view the feed, open up .rawdog/output.html in a browser. The style for output.html is in .rawdog/styles.css. Some other configurable parameters, such as the feed update frequency (rawdog -u doesn’t really update more frequently than the interval specified for the feed in the config file, 3h by default), date formats, etc. can be found in the self-explanatory config file located at .rawdog/config. W3M is a console webbrowser from Japan. It comes with no upfront help or documentation and its default keybinds are outlandish, so I thought to write up a brief guide to get absolute beginners started. where $URL is a web address or the location of a local HTML file. The cursor moves one character at a time with arrow keys, like in an editing environment. W3M is indeed a wonderful tool for web designers. For regular webviewers though, to navigate through the pages quicker, Tab is the key that jumps from a link to next and Ctrl+u does the same backwards. Spacebar scrolls downwards a screen-width and PageUp upwards. Esc does not work as an escape key from fields and situations where the user inadvertently ends up. Ctrl+c does it, mostly. And Shift+b turns back a page (called “buffer” on the options page). To enter a new web address, press Shift+u. To open all links on the page (a function that I always wanted for Elinks, but is available there only by means of a nasty workaround) press Shift+l. / searches forward on the current page. ? searches backward. Shift+q quits without confirmation. Ins opens up a menu with some of the common commands that the user may need. If you need nothing there, close it with Ctrl+c. Shift+h opens up a help page with all the rest of the default keybinds. To study and configure the keybinds, download the W3M default keybinds file to .w3m/keymap. Alternatively. you can save a vi-like set of keybinds for W3M to the same location.